The supercalifragilistic original is back in the west end! Disney and Cameron Mackintoshs multi award-winning musical MARY POPPINS returns to its original West End home at the Prince Edward Theatre.The magical story of the worlds favourite Nanny is triumphantly and spectacularly brought to the stage with dazzling choreography, incredible effects and unforgettable songs. Starring Zizi Strallen, returning to play the title role following great acclaim on the recent sell-out international tour, and Charlie Stemp as Bert,who recently gave an award-winning performance as Arthur Kipps in Cameron Mackintoshs production of Half A Sixpence. 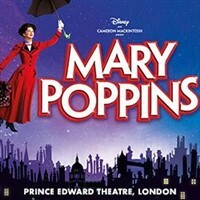 The stage production of MARY POPPINS is brilliantly adapted from the wonderful stories by PL Travers and the original film. It is co-created by Cameron Mackintosh and has a book by Oscar-winning screenwriter and Downton Abbey creator, Julian Fellowes. The Musical features a timeless score originally by Richard M Sherman and Robert B Sherman including the classic songs; Jolly Holiday, Step in Time, Supercalifragilisticexpialidocious and Feed the Birds with new songs and additional music and lyrics, including Practically Perfect by the Olivier award-winning British team of George Stiles and Anthony Drewe.